The copper from the southwest of Ireland was traded throughout Ireland and Britain, these have produced some of the earliest dates for copper in northwestern Europe. But there was a trading of ideas and technology between countries, especially across the Atlantic seaboard. This can be seen in the use of passage tombs (4,000-3,500 BC). They are found in Ireland, Britain, Portugal, Spain, France, Germany, Denmark, Sweden and Poland. We have also evidence of rock from Tievebulliagh in Northern Ireland being found throughout Britain. This type of pottery appears at the start of the Metal Ages. About 2,400 BC it is found in Ireland, Portugal, Denmark, Czech Republic, Hungary and Sicily. Metals appear in these areas about the same time. It is most likely that Beaker pottery was being made locally and it would be too difficult and fragile to transport over long distances. In Ireland it is mainly in megalithic tombs above the Galway-Dublin line. Broken pieces of it were also found with domestic refuse at Ross Island – were these people wealthier? We don’t know. What is distinctive about it? Beaker pottery was also much more decorative than the Neolithic pottery. The use of pinched rolls, the ‘s’ shape and the use of cord impressions are common throughout Europe. Reference to the ‘Beaker Folk’ spreading across Europe is a myth that was probably based on the Roman invasions. As with the spread of Christianity, the ideas and technology spread. As previously said, it was made locally. Was the mining successful? Yes. The high arsenic content and the presence of other trace elements has given us ‘finger-prints’ which allow us to show that copper objects found in Britain are made from Irish copper. The routes for trading stone axes were long established. These routes were now used to trade metals. 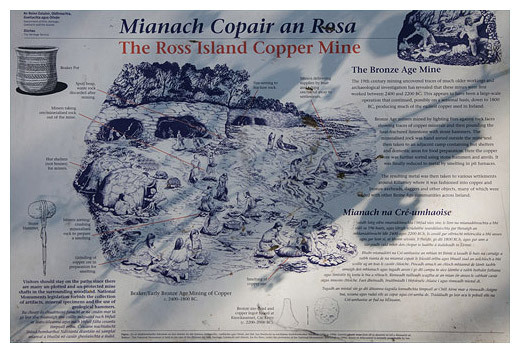 Where was copper found in Ireland? At Ross Island, Mount Gabriel in County Cork, south Waterford, Avoca in Wicklow, Tipperary and Connemara. How did copper technology come to Ireland? Most likely it came from Spain and Portugal and possibly Central Europe. Some things could have been learn accidentally or from experience, such as, that the addition of arsenic to copper makes it harder. Up to the 1980’s it was documented that the Celts brought metal technology to Ireland to the ‘ignorant locals’. This stems from English archaeologists in the 18th and 19th century, partly to justify themselves being here. 1. We can see the progression of the design of axes by the introduction of flanges and more elaborate designs coming from the moulds. 3. Copper cannot be forged, it must be shaped in a mould. 4. The use of fire in mining had existed for a long time, it had been used in Stone Age factories and in the making ceramics. 1. A point worth remembering is that the use of metal only dates back 10,000 years whereas the use of stone dates back million of years. 2. The average Irish Neolithic person was living in better housing than the average 19th century Irish person. 3. Check out William O’Brien’s book on Ross Island. There are about 130 sites that we know of where gold occurs. However, in the majority of these the gold occurs in bedrock and probably was not accessible to Bronze Age man. It is more likely that he got his gold as nuggets and flakes in the sands of rivers and streams, particularly in Wicklow and Tyrone. Gold did not require smelting and is a soft metal that is easily hammering and beaten into shape. One of the significant artifacts from this period are gold Lunulae (s. Lunula). 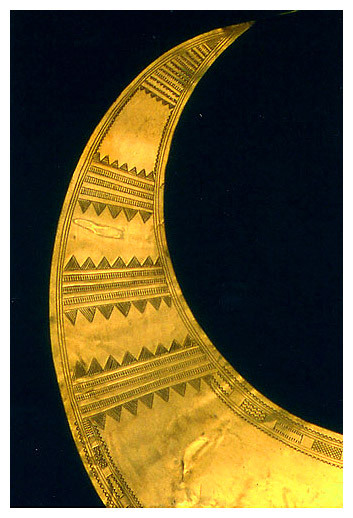 About 60 of these thin gold collars have been found. They are very much an Irish phenomena. The ones that have been found were in areas were they seem to have been placed beyond use, for example in lakes. This may give some explanation for the folklore of gold at the end of the rainbow or Excalibur and the Lady of the Lake surfacing with the famous sword. The exploitation of the land by Neolithic and Bronze Age farmers lead to a leaching of minerals of minerals in the soil and the formation of impermeable hard-pan, causing water-logging. The removal of trees also hindered drainage, making the soils wetter. As a result plant remains began to accumulate on the soil surface, facilitating the growth of ling, sedges and Sphagnum. In this way large areas of lowland and hill sides, especially in the west of Ireland, were lost to productive farming. This was aided by a poorer, wetter climate in the Bronze Age. On a positive note, the covering of the landscape by bog has preserved for us the ancient landscape of 6,000 years ago – as well as artifacts, stone walls, and bodies.